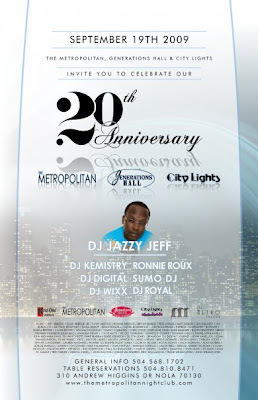 ashlee nicole spills | blog: Metro's 20th Anniversary Party w/ DJ Jazzy Jeff. City Lights, The Metropolitan, and Generations Hall will celebrate its’ 20th Anniversary as New Orleans’ most entertaining, influential, and long lasting nightlife venue the city has to offer. In commemoration of this event we will bring you an eclectic plethora of DJs starting from the beginning. Royal Montz, aka DJ Royal, was the original resident DJ at the beginning of it all when The Metropolitan was known as City Lights some 20 years ago. Following DJ Royal will be Sumo DJ, long time and current residents Ronnie Roux and DJ Wixx, and our current headlining resident DJs, DJ Kemistry and DJ Digital. Headlining the night will be DJ Jazzy Jeff. If you happened to catch DJ Jazzy Jeff’s set a couple months back then you know that his set is just as energizing and entertaining as the novelty his name brings from the big screen and music industry. Come celebrate 20 years of world-class entertainment, sound and lighting, unquestionable guest service, late night dancing, wedding celebrations, fundraisers, birthday parties and most importantly the recognition of a New Orleans Landmark. For bottle service/ table reservations contact Jonathan Warren at 504-810-8471.